Speaking to the crowd in St Peter’s Square before praying the Angelus, Pope Francis focuses on Jesus’ invitation to appreciate how God works through everyone. Before praying the Angelus with thousands of the faithful and tourists in St. Peter’s Square on Sunday, Pope Francis reflected on the day’s Gospel (Mk 9:38-43, 45, 47-48), emphasizing Jesus' invitation to appreciate how God works through everyone. Pope Francis tells priests of Créteil , France, to serve others according to the model of Jesus. Pope Francis welcomed to the Vatican about 100 priests from the diocese of Crétiel, near Paris who are on pilgrimage to Rome. In his address, the Holy Father thanked God for their vocations to be “faithful ministers of the mysteries of Christ.” He noted that today the Church is “battered by opposing and violent winds, especially because of the grave sins committed by some of its members.” But, he said, it is important to remember the “humble fidelity” of the great majority of those called to serve the Church as priests. Pope Francis on October 1 received in the Vatican members of the Rosminian congregation on the occasion of their General Chapter. Pope Francis on Monday received in the Vatican members of the Institute of Charity (IC), known as the Rosminian Fathers and Sisters, saying holiness and the exercise of virtues is the way of the true reform of the Church. The Rosminians, founded by Blessed Antonio Rosmini in early 19th century, are holding their General Chapter until October 23. In an address to the participants of the IV Seminar on Ethics in Health, Pope Francis stresses the importance of forming a bond of profound humanity between health workers and their patients. With regards to the first word, ‘miracle’, the Pope said, “Those responsible for the institutions will tell me, and rightfully so, that we cannot perform miracles”. But, he explained, a miracle is not doing the impossible. A miracle is looking at an ill, helpless person and seeing a brother. The Pope explained that “we are called upon to recognise the immense value of every person’s dignity, as a human being, as a son of God”. This, cannot fix every hitch of society, but it can “clear the way for change”, in our minds and in our society. Pope Francis will celebrate the opening Mass for the Synod of Bishops on “Young People, the Faith, and Vocational Discernment” on Wednesday morning in St. Peter’s Basilica. Cardinal Lorenzo Baldisseri, Secretary General of the Synod of Bishops briefed the media on Synod proceedings and goals at a press conference on Monday morning. 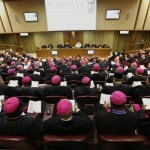 A Synod of Bishops is a crucial moment in the life of the Church. It is a time for it to reflect on its current status and look to its future, a time to adjust to a world in the throes of change and to set itself new goals and adopt new idioms so as not to lose its footing and risk becoming irrelevant. All that is especially true in the case of the Synod taking place here in the Vatican throughout the month of October, because it focuses on the very people who will make or break it in the future: young people. At a press conference at the Holy See Press office on Monday morning, Cardinal Baldisseri carefully explained Synod procedures pointing out that a new Apostolic Constitution signed – significantly – by the Pope just two weeks ago, strengthens the involvement of the “People of God” and further promotes dialogue and collaboration between bishops and between bishops and the Pope. Two bishops from mainland China, including one whose excommunication was lifted just over a week ago, will become the first from their country to attend a Synod of Bishops when they participate in this month’s gathering in the Vatican. During a 1 October press conference in the Vatican, the synod co-ordinator Cardinal Lorenzo Baldisseri confirmed that the Chinese bishops would be attending the assembly as a result of the Holy See and China deal on bishops’ appointments signed on 22 September 2018. As part of that agreement, Pope Francis lifted the excommunications of eight bishops ordained without papal approval by the state-run Catholic Patriotic Association. Among those re-admitted to full communion was the Bishop of Chengde, Joseph Jincai Guo, and he and the Bishop of Yan’an, John Baptist Xiaoting Yang, will make up China’s delegation for the 3-28 October synod meeting on young people, the faith and vocational discernment. Thank you grace-land for your faithful posting. I really appreciate this. Today begins the Synod of Bishops in which young people are the subject. From 3-28 October, Synod Fathers from all over the world, and other invited participants, will explore the theme “Young People, the Faith and Vocational Discernment”. The Synod process began in October 2016 when Pope Francis announced the Synod’s theme. In January 2017, the initial phase of the Synod began with a letter of the Holy Father to young people, and the publication of the Preparatory Document. Input solicited through the Preparatory Document was gathered from the local Churches. In addition, input from young people was requested through an online questionnaire. More than 200,000 young people responded either completely or partially to this questionnaire. In order to include the voices of young people in a more concrete way, a Pre-Synod meeting was held in Rome from 19-24 March 2018. 300 young people participated in Rome and 15,000 others participated virtually. On that occasion, Pope Francis said, "the Church wants to listen to the voice, sensitivity, faith and also the doubts and criticisms of the young. We must listen to the young.” A document prepared by the young people who came from all over the world, and represented Catholics, non-Catholics, and unbelievers, was presented to Pope Francis on Palm Sunday. The working document for the Synod contains material from this document as well as a summary of the input sent in from the local churches. Pope Francis at the opening Mass for the Synod of Bishops on "Young People, the Faith and Vocational Discernment"
Pope Francis celebrated the opening Mass of the Synod of Bishops on Wednesday expressing his trust in young people, whom he said, are called to help renew the Church’s capacity to dream, to hope and to build a better world. Speaking during his homily at an open-air Mass in St. Peter’s Square that inaugurated the 3-week Synod on “Young People, the Faith and Vocational Discernment”, Pope Francis called on his brother bishops to heed the voices of young people in the effort to build a better world than that of their elders. It is with an attitude of docile listening to the voice of the Spirit, he said, that “we have gathered from all parts of the world”. He remarked on the fact that for the first time, at the Synod, there are two bishops from mainland China and that “the communion of the entire Episcopate with the Successor of Peter is yet more visible thanks to their presence”. In his Opening Speech for the Fifteenth General Assembly of the Synod of Bishops, Pope Francis said “the Synod we are living is a time for sharing” – sharing that must involve both speaking with courage and frankness, and listening with humility. The Synod, he said, “must be an exercise in dialogue,” especially for those directly participating in the event. Pope Francis emphasized that the Synod “is an ecclesial exercise in discernment,” an “interior attitude rooted in an act of faith.” One of the innovations in this General Assembly will be moments of silence after every five speeches, precisely in order for participants to discern what they have heard. WASHINGTON (CNS) -- With Pope Francis midway into the sixth year of his pontificate, the percentage of U.S. Catholics who view him favorably, while still strong, is noticeably down. On the first morning of the synod on young people, speakers from different continents offered “a world perspective” on the situation and reality of young people, Thomas Rosica, C.S.B., the chief executive of Salt and Light Television in Canada, told journalists on Oct. 4. Topics included the plight of migrants, the need for a listening church, the credibility of the church and the abuse scandals that call its credibility into question. The prefect of the Vatican’s communications dicastery broke the news that the synod, in its first vote, elected five members to the information commission, one from each continent: Cardinals Gérald Lacroix (Canada), Wilfrid Napier (South Africa), Christoph Schönborn (Austria), Luis Antonio Tagle (Asia) and John Fisher (Australia). But it was revealed during the press briefing that the synod had actually elected Cardinal Robert Sarah for Africa, but he turned down the election “for personal reasons,” and so Cardinal Napier, who came second in the vote, took his place.